Welcome to our shop in Haarlem. Our hostess will welcome you with a cup of coffee. The opening hours are Wednesday to Saturday 10 -17h. Haarlem is our headquarters. It is where owner Rob Smit began selling stamps in 1983. Over the years PostBeeld has expanded to include two adjacent buildings and now this is, with over 200m2, our largest store. Our headoffice is also situated in Haarlem. Here our websites are maintained and part orders from other locations merged into one and sent to our customers. 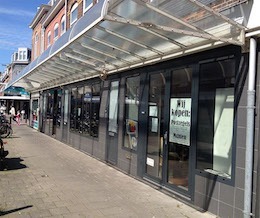 The shop is located at 17 Kloosterstraat. A large public car park (Cronje) is a short walk from the store. Haarlem railway station can be reached on foot in 10 minutes. Our headoffice is located at Emrikweg 21B. Welcome to our shop in Leiden, where Jaap is your host. The shop is open from Wednesday to Saturday (inclusive), from 10.00 to 17.00 (other days by appointment only). De Leidse Postzegelhandel is one of the oldest stamp shops in The Netherlands, in business since 1941,and situated in Vrouwensteeg 3 in the heart of the old centre of Leiden. In October 2014 ownership transferred to PostBeeld, thus becoming the third PostBeeld store. 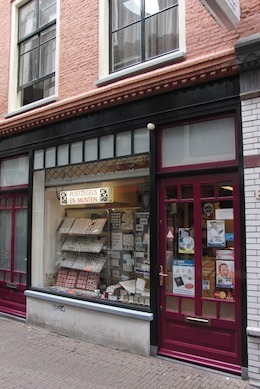 The shop will continue to operate under the old name we respect so much with the addition of PostBeeld in the title to become “PostBeeld, de Leidse Postzegelhandel”. Vrouwensteeg is a street off the Haarlemmerstraat. In this shop you can find albums, storage systems, catalogues etc. Both new and second hand. There is always a good stock of stamp books, with prices from a few euros to those worth hundreds. These books can be viewed only in our store. Unlike the rest of PostBeeld’s stock, they are not available to view via the internet. The shop also has a fine stock of coins and banknotes. 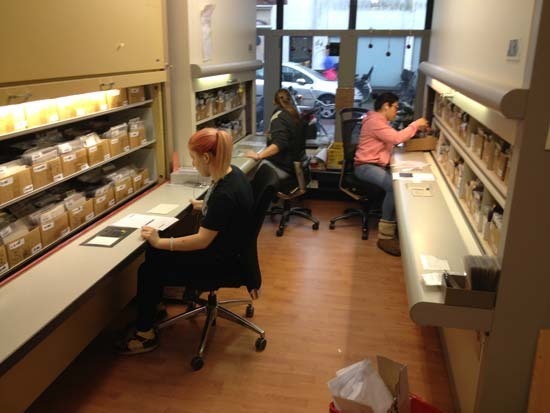 Behind the scenes we work with great care to process your order. At our Haarlem headquarters there is a lot of activity. About 25 people work here on two locations dealing with customer orders and administration. Although our stock is held at around ten different locations in Europe, the Haarlem shop holds the greatest part of PostBeeld's stock and the purchasing department is also based here. If parts of an order are located elsewhere, everything is gathered together in our Haarlem office before being despatched to the customer. 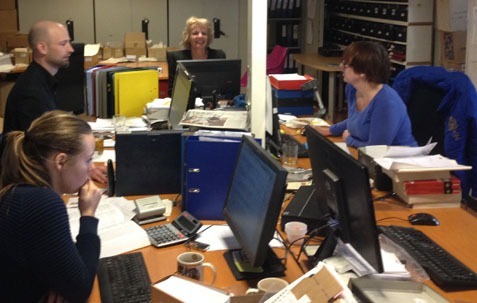 Our translators and customer service department staff are also based in Haarlem. In the photograph above orders are picked from our stock. Below are some behind-the-scenes PostBeeld photos. 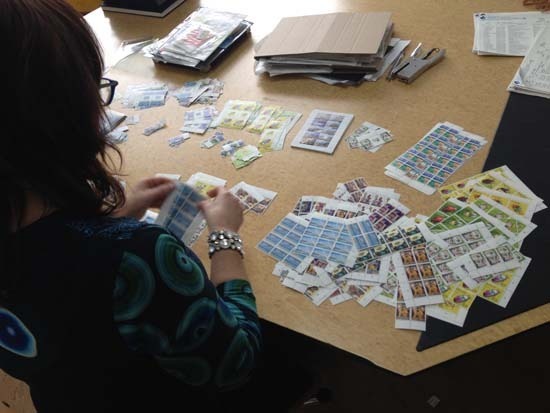 Processing new issues for subscribers in our online store. 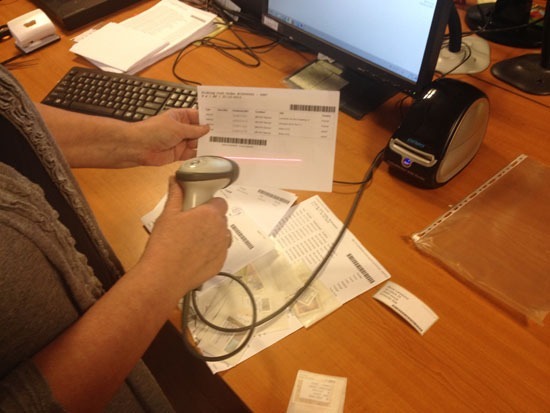 Checking that all partial orders are present is done via barcodes. They are then combined and shipped to the customer. 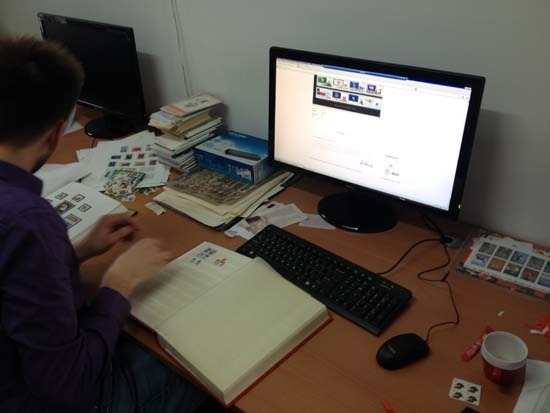 Here work is carried out on the website, translation and administration.